Mr. Duez - Teacher - Atascocita High: 538 - At This Point... Obama Ahead. 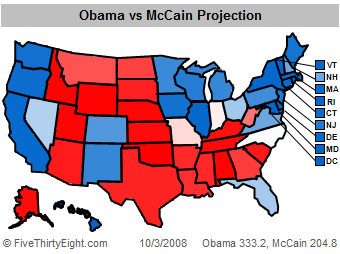 538 - At This Point... Obama Ahead. On the 538 Polling Site: www.fivethirtyeight.com it looks like Barrack Obama is doing pretty well. Also the site Electoral-vote.com is a great one. Shows exactly how this thing breaks down. Really interesting to look at this graph: Click Here for graph of events/polling It shows that just after McCain uttered last Monday that the economy was "fundamentally strong" he has sunk. It's quite dramatic. And an interesting history of the past year. Who will win? Who knows. But, it is fun to watch.